Identifying anomalies wherever they are ! Home » Uncategorized » What is Probability Slicing ? Please explain ! What is Probability Slicing ? Please explain ! Is a Quaddie better value than an All-Up ? Take Black Caviar in a Box Trifecta ? Not on your Nelly ! One of my good clients, (Pauline H. :-)) contacted me the other day and said “please explain” why Probability Slicing is such a good way to make exotic bets such as Quaddies. So I thought I’d do a posting on it with an example which will hopefully explain the concept . Firstly just a bit of background about how Quaddie dividends are calculated. Let’s take a 5 runner field where the TAB Tote win divvies of the 5 runners are 2.0, 4.0, 6.0, 8.0 and 10.0. If you do the maths then this represents a margin of 14% which is roughly what the TAB take out of the Win pool. And for the sake of the example let’s say that all 4 races in the Quaddie have 5 runners with the same odds. That means that the All-Up dividend if the 4 favourites win will be $16.00. However if you do the maths and take into account that the TAB takes out 20% of the Quaddie pool before declaring the dividend, then the equivalent Quaddie dividend is $21.75 which is an inherent advantage of +36%. 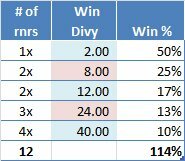 Similarly if all 4 outsiders won then the All-Up dividend would be $10,000 compared to the Quaddie dividend of $13,590 which again is an advantage of +36%. If you are wanting to outlay $100 in a flexi bet and take the top 3 in each of the 4 legs then that would mean there are 81 combinations being covered in one flexi bet and this means that you would have 123.46% of the winning dividend . If the 4 favourites salute then you get back a princely amount of $26.85 resulting in a loss of $73.15. However if the 4 runners with odds of 6.00 get up then the return would be a huge $2,174.54 for a profit of $2,074 ! But clearly this is not a very satisfactory way to bet. Instead of taking one flexi bet why not take every combination in proportion to its expected dividend. This would result in 81 individual bets having to be placed. But the smallest unit of investment is $0.50 and if you take the longest paying combination for $0.50 (the 4 runners with odds of 6.00) then you will return would be $880.69. But to get this same return if the 4 favourites win you would have to have $40.50 on this combination. And then your total outlay to get the same return back for every one of the 81 combinations would be $464.50 instead of your targeted $100. There must be a better way … and the better way is Probability Slicing. So for the same 81 combinations TAB Probet will group like paying combinations together and instead of having to outlay 81 individual bets, TAB Probet generates a series of flexi bets in an attempt to give you the most uniform return for your outlay. In the above example TAB Probet would generate individual bets ranging between $9.00 and $0.50 for a total outlay of $101. What I’ve done now is to split up the win percentage equally between all runners in the same colour band. For example instead of there being one runner with a win dividend of 10.0 there are now 4 runners with a win dividend of 40.0. You’ll notice the sum of the win dividends still add up to 114% even though there are 12 runners. Now suppose that in one of the legs you actually took the 4 runners that were at 40.0. TAB Probet will recognise this and effectively combine your 4 runners at 40.0 as if there was just one runner at 10.0. Or if you have 3 runners at 21.0 it’s as if there was just one runner at 7.0. Or if you have 2 runners at 10.0 it’s as if there was just one runner at 5.0. And so on. In this way TAB Probet minimises the total number of bets that have to be placed but at the same time gives you the benefits of Dutchbook exotic betting. Sometimes you just know that the dividend will not pay very well unless it falls within a particular range. TAB Probet also has the concept of being able to filter out combinations that are expected to pay either less than a minimum specified amount or greater than a maximum specified amount. In that way it will give you the best bang for your buck. There is also a number of other nice features of TAB Probet to allow you to optimise your betting returns. So if you’re interested go to www.tabprobet.com.au where you can download a free version (TAB Probet Lite ) with many of the features talked about above. By anomalynick in Uncategorized on November 29, 2013 .